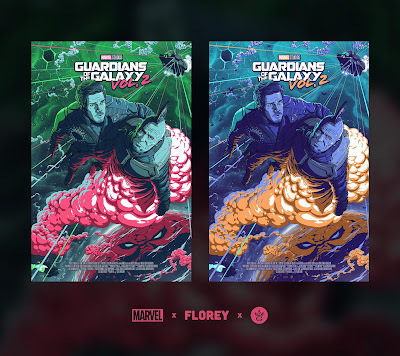 Grey Matter Art continues Florey’s epic series of Marvel Cinematic Universe screen prints with this awesome movie poster for Guardians of the Galaxy Vol. 2! This officially licensed release for James Gunn’s 2017 MCU film could not have been more perfectly timed as Marvel just announced that Gunn has been rehired to write and direct Guardians of the Galaxy 3. Guardians of the Galaxy Vol. 2 by Florey is a 24”x36” hand numbered Marvel screen print. The Regular Edition is limited to 175 pieces and retails for $45, while the Variant is limited to 125 pieces and will retail for $55. Both versions will go on sale at 1pm EST this Thursday, March 21st, at the Grey Matter Art online store.